You are here: Home » The BoostAndBoobs.com April 6th No Pants Dance! I’ve been gone for several months and now I’m back and cannot think of a better way to celebrate than to throw a party for you and I! 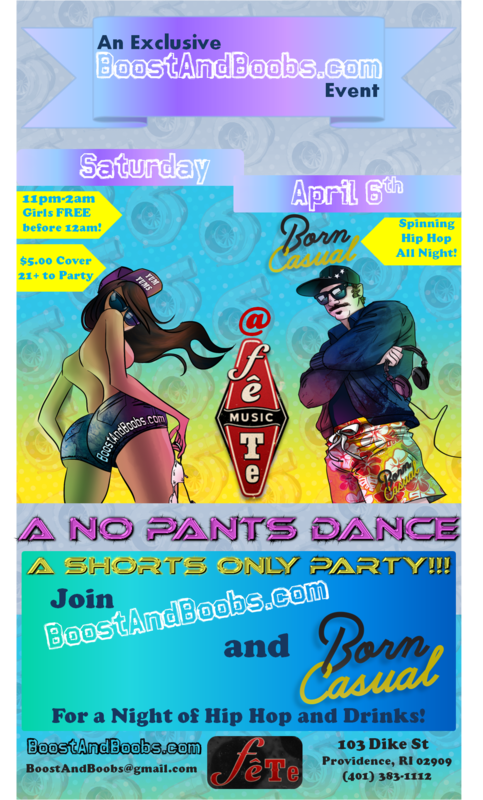 Please mark your calendars and spend the night with BoostAndBoobs.com and Born Casual at Fete, where I have the WHOLE DANG PLACE just for BoostAndBoobs.com fans and friends! That’s right! The venue is entrusting me with party rocking with all of you! My event is public and open to everyone. Once the event page is up, please feel free to share and invite those that would enjoy this night. With that said, I absolutely do not want douchebaggery or idiot ridiculousness to take place. Fete has been kind enough to allow me to celebrate with my fans, and I intend to show them we can have a good time with NO dramas… or else, you will be escorted out with a swiftness. There is a DRESSCODE! Wear SHORTS!!! Booty shorts, Spandex shorts, Ripped Denim shorts, Basketball shorts, Shorts with leather boots, Bermuda shorts, Cargo shorts, Surf shorts, Sparkly shorts, Jorts, Brazillian Booty shorts, Shorts with knee high socks and slippers, Camo shorts, Shorts with stilettos, Boxer shorts, etc., etc., etc…. Below is the OFFICIAL INVITE with drawings of BoostAndBoobs.com and Born Casual done by amazing artist and close friend, Reuben Negron… Yes, he actually took pics of us and drew and immortalized us forever! Thank you to such talented friends that enrich my life with their awesome. If you have any questions, you can leave a comment here or email me directly at: BoostAndBoobs@gmail.com! Its been a long time since I’ve seen many of you, and I am sooooo excited that we have a date night! Remember, 21+ to party and drink and booty pop! ← Travels McTravelsen and Why I Phking Hate Packing. Hey Yum Yums, Met you at Red Sox Opening Day last year with Ann Marie. What’s the chances you’ll be there this year? And are u gonna bring another hottie (besides yourself)? I hope so. Hi, Corey! Yes, of course I remember you! Baseball season is coming up! We probably be there again! And, I’m always surrounded by hotties, so I will prob be bringing more! Thank you for the comment! I’ll def be at the Patriots Draft Party next month…. Will you be there? when you say wear shorts does that mean i can’t wear a t shirt either lol?